Welcome to the Air&Space /Smithsonian Magazine home page on the World Wide Web . Good Early Morning from AIR&SPACE Magazine. (It's 3:20 AM on Sunday, October 20, 1996 at our secret west coast base.) We are always happy to see Netscape users at our site. You'll see the best our site has to offer! As of now, we've served 117726 copies of our home page. For those of you who want quick text based site navigation or a page not currently listed on the home page, try our Table of Contents page. Tell us what you want to see at the website or in the magazine with our visitor Feedback page. report on counterfeit parts for airliners. Is traveler safety being compromised? All this and more in the Oct./Nov. 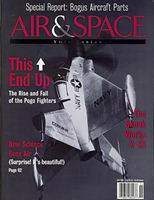 1996 issue. We're pleased to introduce SpaceBeat, wherein veteran space reporter and Air & Space/Smithsonian Contributing Editor Greg Freiherr brings us news and views of missions, programs, and plans from the aerospace world. Air & Space associate editor Diane Tedeschi recently interviewed Colonel Donald S. Lopez, U.S. Air Force (ret. ), who flew a Curtiss P-40 Warhawk with the 23rd Fighter Group in China. After the war, Lopez worked as an Air Force test pilot at Eglin Field in Florida, experiencing firsthand the United States' transition into the Jet Age. Read her interview and view wartime footage of P-40s flying formation over China. Air&Space/Smithsonian is pleased to welcome WINGSPAN, a cable television channel devoted entirely to flight and aviation, to our Aviation Exposition. Once a year, the last of the big iron from World War II and three other classes of closed course pylon racers show up in Reno, Nevada to see who has the fastest airplane and who is just talking. In our April/May 1992 issue, we took a look at "The Last Piston Show". ON MINATURE WINGS will take you on a guided tour of some of the National Air and Space Museum's model aircraft collection's highlights. Lavishly illustrated with over 150 full-color photographs, this book offers a fact-filled introduction to the marvelous miniature world of aeromodeling. Follow the adventures of Tom Claytor, Bush Pilot in his solo expedition to the seven continents of the world. Speaking of bush flying, the Alaskan Region of the FAA has posted Flight Tips for Pilots in Alaska, which contain more than you may want to know about flying in the great north. And, finally, we ran across a wonderful little Amelia Earhart site you should see. Here is a sample from our Sightings page, where we feature unique QuickTime and QTVR movies, including the C-130 Landing on the Aircraft Carrier. From "Runways of Fire". In a Cold War program, tests were conducted to see if aircraft could be captured on short runways using arresting cables. In this Sighting, an F-84 makes a successful - although abrupt - arrival at the test rig. Runways of Fire: The Video. Featuring historic footage with contemporary production and analysis, this just-completed family video will provide hours of entertainment for aviation enthusiasts. Air Combat U.S.A. is the original fighter pilot training group, featuring instruction in SF-260 fighter-trainer aircraft. The 1995 International Council of Air Shows Convention in Las Vegas offered evidence that Air Shows may be about to move out of the hand crafted amateur event status and become big time show business. Our Visitor Contact InfoBase is an all purpose bulletin board and contact clearing house for those on the information highway looking for others with similar interests. Take a moment to fill out our entry form, and let others know who you are and what your aerospace interests are. Then you can search the InfoBase for others with similar interests and discover how to get in touch. This page updated on Friday, October 4, 1996. This page served 117726 times.